Over the years, Bible Software has become an integral part of my research, sermon preparation, and classroom instruction. As I explained yesterday, I have used many products over the years, but over the last year and a half LOGOS has begun to assume a central place. The first thing you need to know about LOGOS is that it is first and foremost a digital library. It is a program designed to give you access to books—and lots of them. The size of your library depends upon what base package you buy. The higher the base package, the more books you get. As I noted yesterday, I have used LOGOS for about 13 years, and right now I have an upper level base package (Diamond). In addition, I have purchased some books that aren’t included in my base package, which expands the library even more. 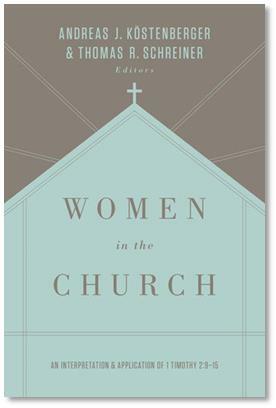 Recently, for example, I have been writing a commentary on 1 Corinthians. 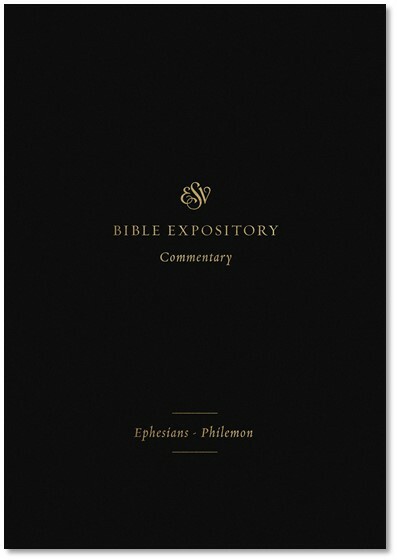 So I have purchased commentaries on 1 Corinthians not included in my package, and I will probably end up purchasing more. The resources that I have at my fingertips in LOGOS 8’s Diamond package are immense. 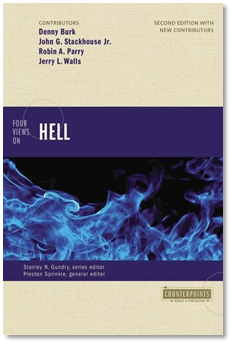 The commentaries on the Bible include the NAC series, NIGTC, ICC, Black’s, Pillar, and a host of others. There are countless English translations available, including all of the major ones that ordinary readers would wish to have access to. For me, the most valuable books are the original language texts—in particular the Greek and Hebrew Bibles. As usual, these are morphologically and lexically tagged so that you can use them with the lexicon of your choice. I use BDAG and LSJ for the New Testament and HALOT and BDB for the Old. In addition to that, there are a number of very good Greek grammars available, including A. T. Robertson’s classic work and Stanley Porter’s Idioms of the Greek New Testament. 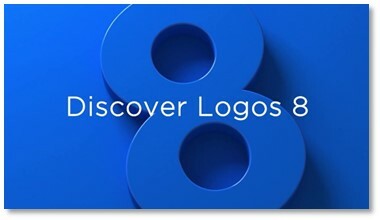 The resources available on LOGOS 8 far surpasses those that were available in software I have used in the past (like Gramcord and BibleWorks). In fact, there is no comparison on that front. Nothing replaces a good bricks and mortar library in terms of biblical and theological research. But the only software that even competes in the area of biblical studies is LOGOS. I cannot overstate the value of being able to access these materials at any place and at any time. Over the last several years, my work has come to include a great deal of travel. Being able to have a significant portion of my library with me wherever I go is huge. And at this point, I haven’t even said one word about the features in LOGOS, only the library. But that aspect alone makes LOGOS an indispensable tool for me. The user interface in LOGOS has improved dramatically over the years, but I think that LOGOS 8 may be the best yet. It does feel more intuitive and up to date than previous versions. As I mentioned yesterday, the software runs more swiftly than previous versions, with searches being about ten times as fast as they were in LOGOS 7. 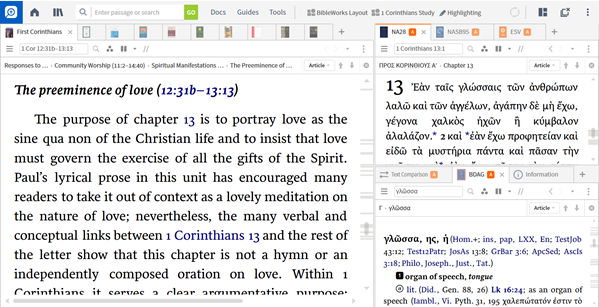 BibleWorks users will notice that the logic of the three-pane interface looks very much like BibleWorks, with search pane on the left, original text in the middle, and analysis on the right. This information is the bread and butter of exegesis, and LOGOS 8 puts the information at your fingertips faster than it ever has in the past. In this layout, I have Richard Hays’ commentary open on the left, the NA28 open on the top right, and BDAG open on the bottom right. Each of the panes has other resources open, and all I have to do is click the tabs to access them. Notice that when I am reading commentaries, I always keep the Greek text and lexical analysis within my line of sight. This saves so much time—to have this all on one screen rather than have to switch back and forth among hard copies of several different books. If I were to expand on all the feature included in LOGOS, it would push this review far past any reasonable length. There is a sophisticated note-taking system within LOGOS that many users value very highly (I haven’t used it yet). 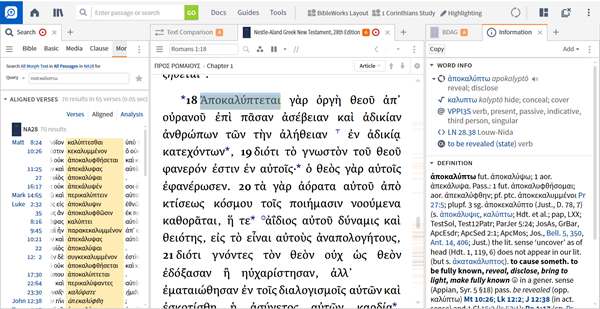 There is also a graphical interface called “Canvas” that allows users to make their own analysis of biblical texts. I mention them here not because I’ve used them but simply because many users love them (see here for example). Notice that the left pane has hyperlinked information about genre, authorship, etc. 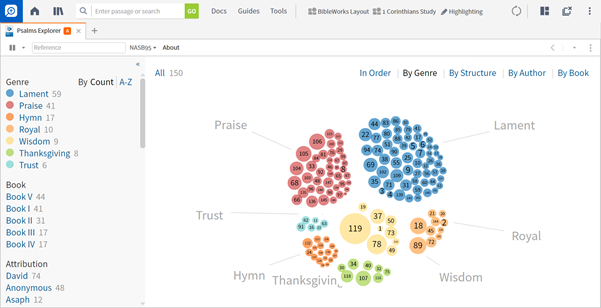 You can see, for example, exactly how many lament Psalms there are under the genre section. You can then click on the lament Psalms and all of them will appear in the graphical interface to the right. Once you start clicking around in here, you will be amazed by how much information is packed in. That is why I use this when introducing the Psalms to my students. It really helps them to see the big picture within the Psalter. Again, this is just one helpful feature among countless others that I cannot fit into this review. I love LOGOS 8 and am currently using it all the time in my studies. For me, it has become a regular part of research, sermon preparation, and even classroom instruction. The packages range in price from $294.99 to $10,799.99. That is a wide range, but the cost to you is going to depend on how much you can afford and how big you want your library to be. Most people are not going to pony-up more than ten grand on a computer program. But many will find it reasonable to look into some of the lesser expensive packages that are nevertheless packed with many useful resources. You can compare packages here and price them here. The good news is that LOGOS is offering a launch discount on Logos 8–10% for first-time base package purchasers or 25% for upgraders. This deal only lasts until February 7, so if you’re going to order you’ll want to do so before then. LOGOS 8 has become an invaluable resource for me. I am certain that it will prove to be valuable for many who read this review. Therefore, I give this software my highest recommendation.